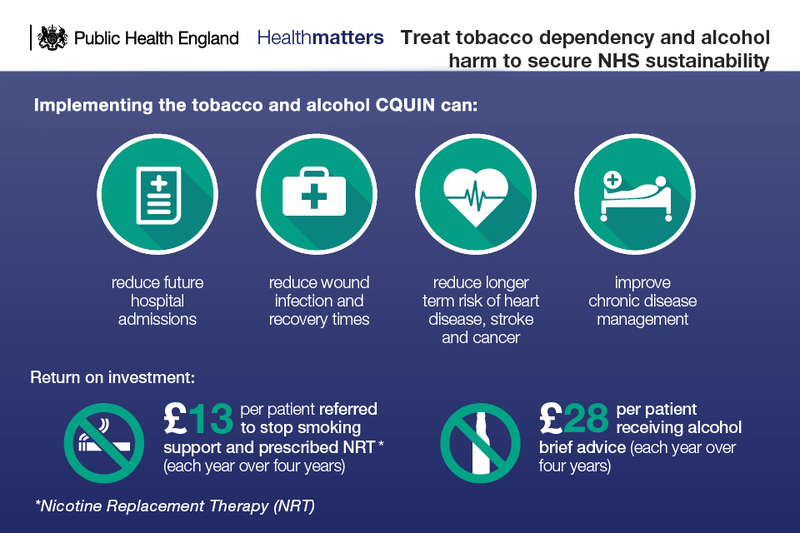 This professional resource focuses on preventing ill health caused by tobacco and alcohol use and makes the case for why NHS providers should implement the Screening and brief advice for tobacco and alcohol use in inpatient settings CQUIN, published in March 2019. See also Public Health England’s implementation guidance. Smoking and harmful use of alcohol are amongst the most significant risk factors in the burden of disease in England. Tackling smoking provides the biggest opportunity for making services across the entire health and care system more sustainable. 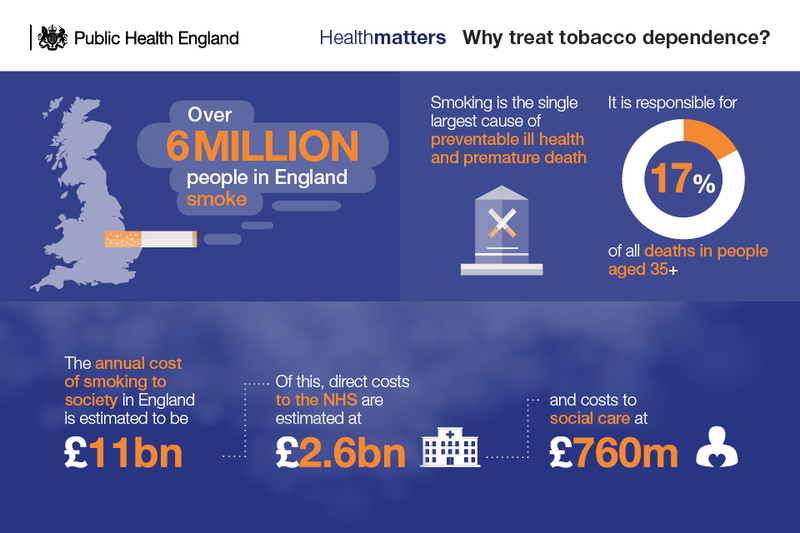 The NHS in England spends approximately £2.6 billion a year treating smoking-related conditions. Every £1 spent on smoking cessation saves £10 in future health care costs and health gains according to the NICE tobacco return on investment tool. The NHS Five Year Forward View makes a commitment to make all NHS trusts, both mental health and acute, smokefree by 2020. A large number of smokers can be reached through health services and in particular in hospitals. 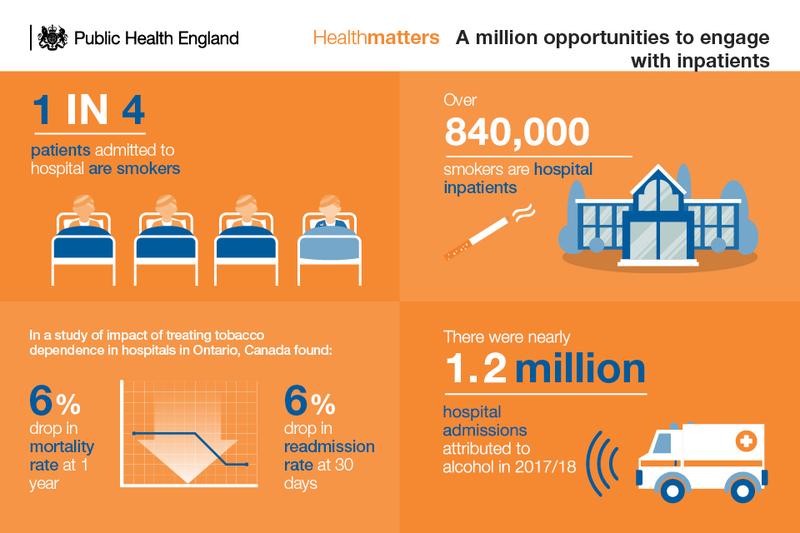 It is estimated that 1 in 4 patients in acute hospital beds in England are smokers and this presents a unique opportunity to offer smoking cessation advice. A joint survey by Public Health England and NHS England found the prevalence of smoking in secure mental health units was even higher; 64% of patients smoked. The British Thoracic Society audit of smoking cessationfor secondary care in 2016 found that this opportunity to reach smokers through health services is not being exploited. 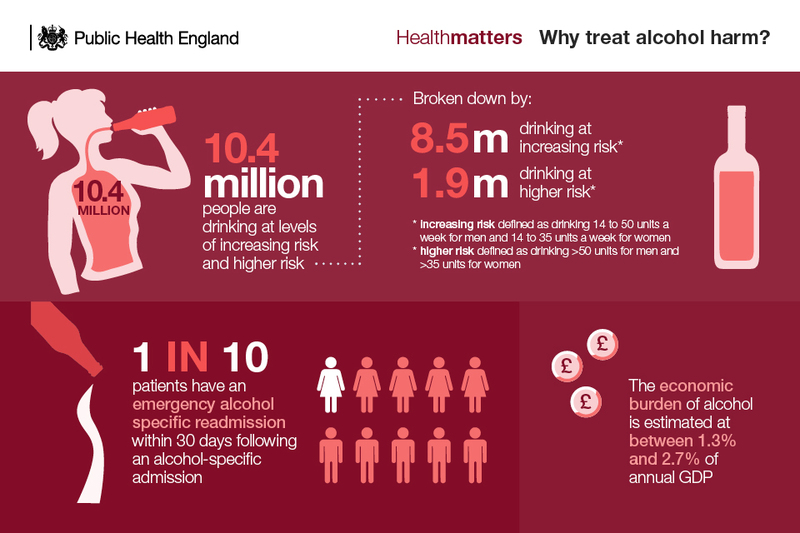 In England, 10.4 million people consume alcohol at levels above the UK chief medical officers’ (CMOs’) low-risk guideline and increase their risk of alcohol-related ill health. There were over 24,000 alcohol-attributable deaths in 2017. In 2017 to 2018, there were nearly 1.2 million admissions related to alcohol, of which alcohol was the main reason for admission for about 338,000 cases. 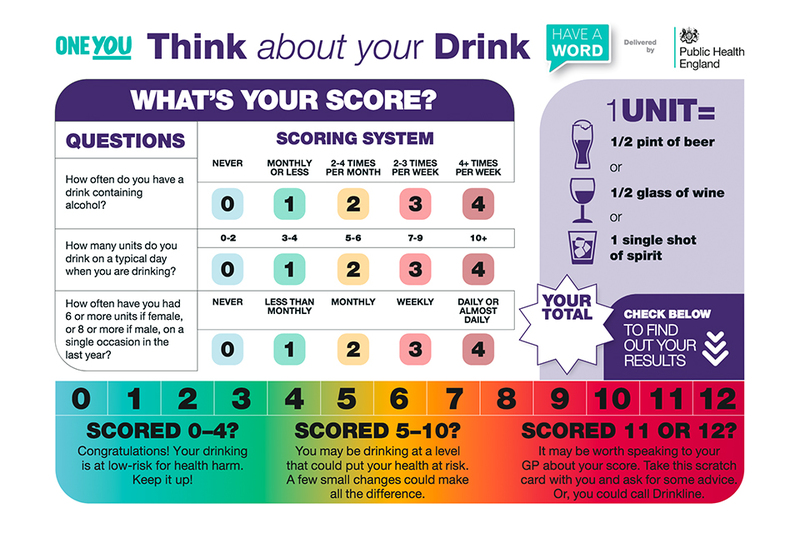 Alcohol identification and brief advice (IBA) can identify and influence patients who are drinking above low risk, but the level of implementation is varied across the country and nowhere near the optimal large scale delivery required to significantly impact on population health. The CQUIN applies to community, mental health and acute providers. It covers adult inpatients only (patients aged 18 years and over who are admitted for at least one night) and excludes maternity admissions. The percentage of eligible adult patients who are admitted and screened for smoking and alcohol risk status and results recorded in patient’s record. The percentage of eligible patients who have been identified and recorded as smokers that are given brief advice, including an offer of Nicotine Replacement Therapy (whether or not this offer had been taken up). The percentage of eligible patients who have been identified and recorded as drinking above low risk levels are given brief advice (or offered a specialist referral if the patient is potentially alcohol dependent). All of these activities are directly linked to CQUIN payments. 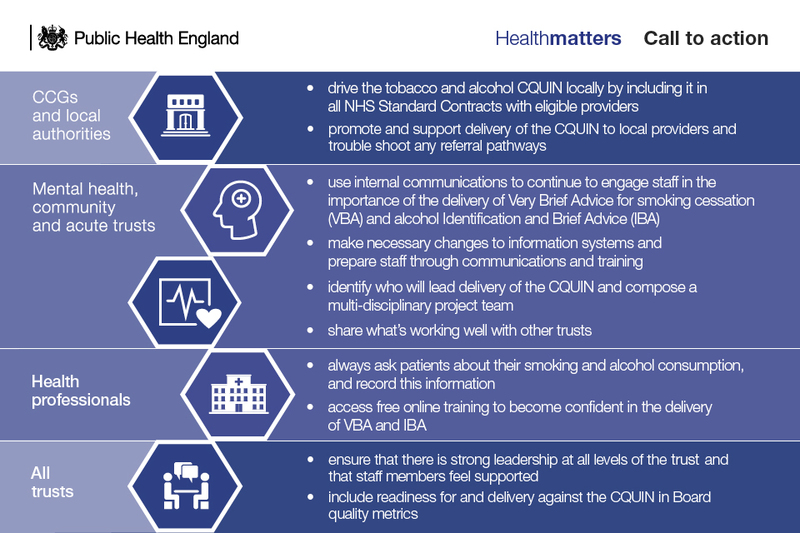 This CQUIN will help providers to implement the guidance produced by the National Institute for Health and Care Excellence (NICE), on reducing smoking in acute and mental health settings and preventing alcohol use disorders. Healthcare professionals can provide VBA in as little as 30 seconds. The intervention is made up of 3 core components: ASK, ADVISE and ACT, although public health benefits are maximised when healthcare professionals refer patients directly for an evidence-based smoking intervention (in the community or on site) with behavioural support and stop smoking medicines. Healthcare professionals do not require a comprehensive knowledge about tobacco dependency to deliver VBA effectively. A free short online training module on providing very brief advice on smoking is available from the National Centre for Smoking Cessation and Training (NCSCT). ASK and record smoking status: is the patient a smoker, ex-smoker or a non-smoker? ADVISE on the best way of quitting: the best way of stopping smoking is with a combination of medication and specialist support. ACT by offering referral to specialist support and prescribing medication if appropriate: smokers who get expert support are up to 4 times as likely to quit successfully. A Cochrane Review shows that smoking cessation interventions are effective for hospitalised patients regardless of admitting diagnosis. The quit rates among patients who want to quit and take up a referral to stop smoking services are between 15% and 20%, compared to 3% to 4% amongst those without a referral. The Ottawa model has shown just how effective hospital-initiated smoking cessation advice can be when offered to every person admitted to hospital regardless of what they are in for. Alcohol identification and brief advice (IBA) aims to identify and influence patients who are drinking above low risk. IBA is most impactful when it helps identify and advise patients who are not dependent on alcohol, but whose drinking is increasing their risk of a wide range of ill health linked to drinking alcohol. In addition, the intervention will identify dependent drinkers who may need further specialist support. The Cochrane Library research suggests that IBA can reduce weekly drinking by 8% on average. Reducing regular consumption by any amount reduces the risk of ill health. Healthcare professionals do not require a comprehensive knowledge about alcohol harm to deliver IBA well. 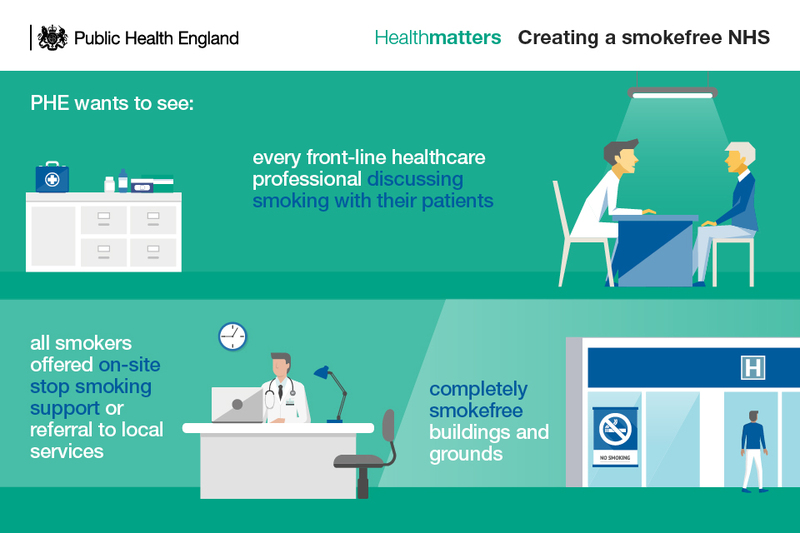 A free short online training module on providing very brief advice on smoking is available from Health Education England. Asking the 3 AUDIT C questions verbally and scoring their answers, or giving patients an AUDIT-C scratch card to self-complete. Feeding back to the patient what their score indicates about their health risk. Providing a patient information leaflet with information about harm, benefit and cutting down to patients who drink above low-risk levels (but are not dependent). For patients who are identified as potentially dependent drinkers, healthcare professionals should refer them for specialist alcohol assessment. For patients who are identified as harmful or potentially dependent drinkers, consideration should be given for further investigation of liver disease in line with NICE NG50. IBA can be approached efficiently through the use of this CQUIN by broaching the subject of drinking above low risk at the same time as addressing smoking with hospital patients. This CQUIN provides an important opportunity to improve patient health across England through the delivery of short, simple and evidence-based interventions. For it to be effective, we need all health professionals to play their part. Progress the CQUIN locally by including it in all NHS Standard Contracts with eligible providers. Promote and support delivery of the CQUIN to local providers. Cooperate with local trusts and community services to ensure smooth pathways exist to refer patients between services. 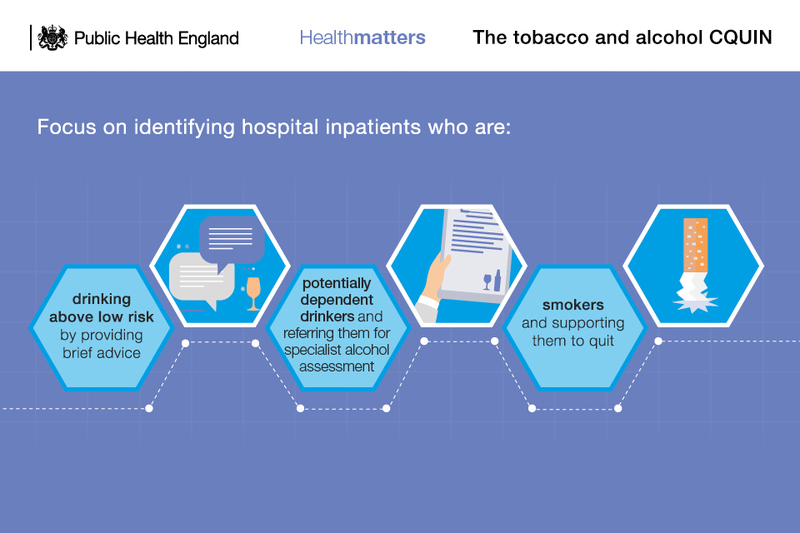 Make it your responsibility to always ask patients about their alcohol consumption and smoking, and to provide simple and short advice and support to help patients to stop smoking and to minimise harmful alcohol consumption. Access free online training to become confident in the delivery of IBA and VBA. Ask who is leading delivery of the CQUIN in your trust, know what’s involved and become a champion. Ensure that the CQUIN is included in the NHS Standard Contract. Facilitate the successful delivery of the CQUIN by ensuring that there is strong leadership at all levels of the trust and that staff members feel supported to deliver these interventions as part of usual care. Ensure there is a system in place to record the interventions in patient notes and report to the board on performance. template briefing document for frontline staff.